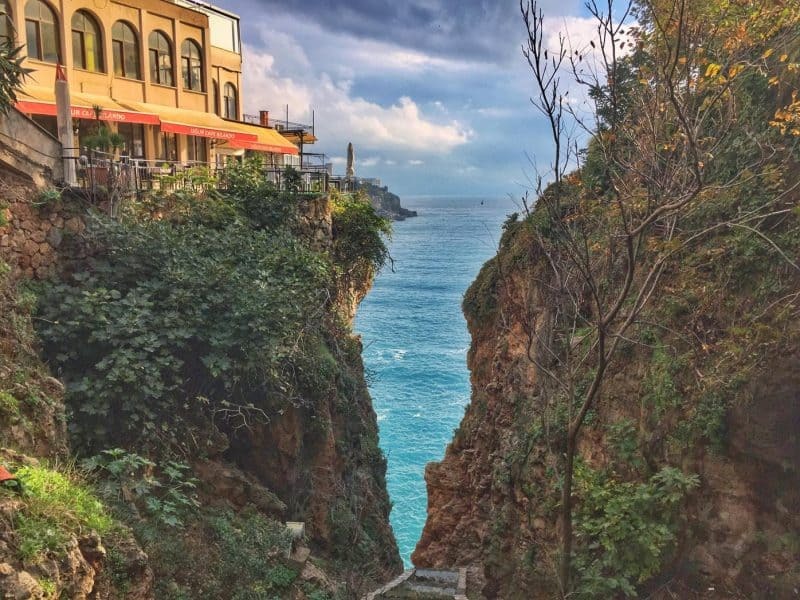 This Antalya Itinerary is a guest post from Jub. Antalya’s coast might be known for its all-inclusive resorts, however, Antalya’s activities go far beyond unlimited cocktails and beach loungers. 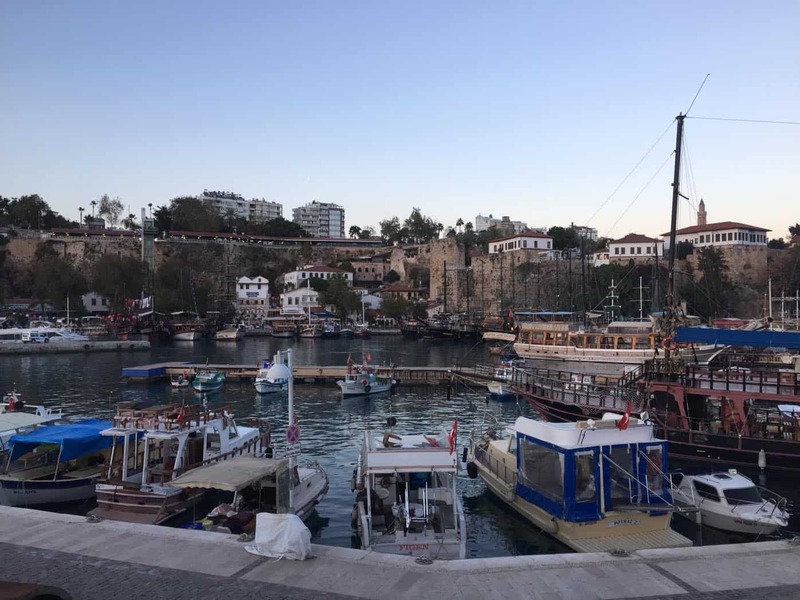 If resorts aren’t your thing, and you find yourself with two days in Antalya, the following list of things to do in Antalya will make sure you get a taste of everything the city has to offer. I spent all of November in Antalya (2017), so the prices are current as of then, and you can bet I’m offering the best of Antalya’s activities for your precious two days. Who am I? I’m Jub from New Zealand. I ended up spending the month in Antalya to train for the Mersin Marathon. When I wasn’t yelling out the best sports quotes while running around the streets of Antalya, I was out and about exploring. Whether you arrive in Antalya by bus or plane, you can catch the tram into the city. I made the mistake of paying for a full fare into the city on arrival. Instead, you should purchase an Antalyakart card as they’re cost effective and can be used for both local buses and trams. The card costs 5 TL and then tram rides cost 2 TL and bus rides 2.60 TL regardless of distance (November 2017). With a regular bus fare costing 6.50 TL you quickly save money with the Antalyakart Card. You can purchase them from booths at both the airport and bus station. The airport and bus station are serviced by the same tram line (at opposite ends). The stop you’re likely going to get off is at Muratpasa or Ismetpasa in the heart of downtown, close to most of the accommodation options and the Old Town. And yes, you will need to validate your Antalyakart card as there are turnstiles at all tram stops. For 48 hours in Antalya, start with 10 TL credit, which you can top up if required. Antalya is located right on the coast so on day one stay close to the city center and explore the coastline. 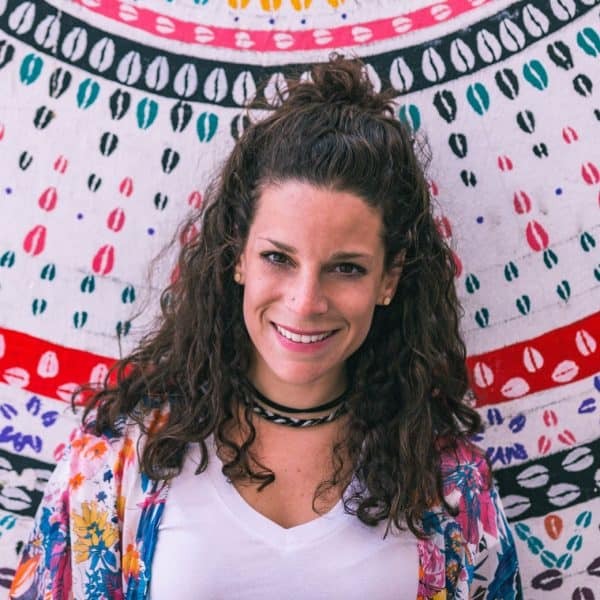 I have listed the activities in the order which I think they are best suited, but you can interchange them to suit your needs. Enter the old town via Hadrian’s Gate, a landmark in itself. 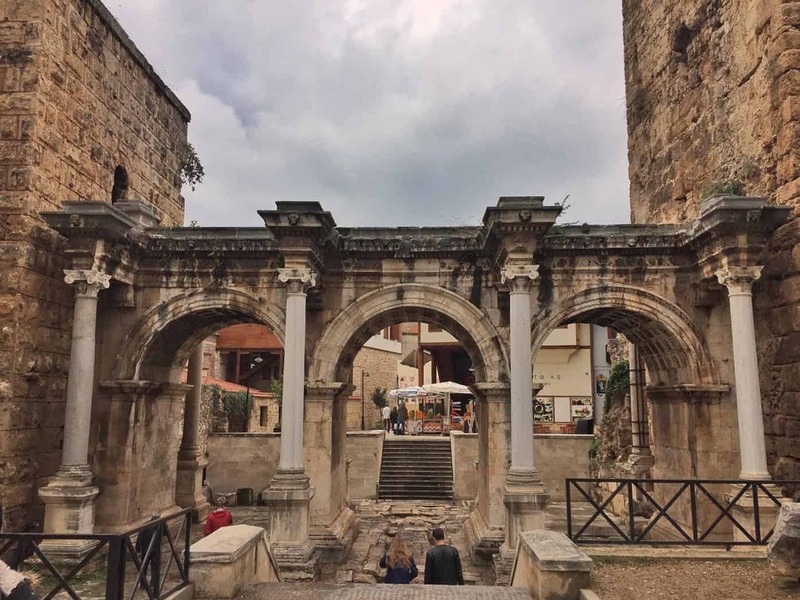 Exploring The Old Town via Hadrian’s Gate is one of Antalya’s best activities. The Old Town is quite varied, so there’s no need to follow a fixed path. There are lots of cafes and restaurants throughout, so find one that looks good to grab a bite to eat (if you’d like to eat somewhere cheaper, eat somewhere outside the Old Town). Note: there’s only one free walking tour in Antalya (on Friday at 10:30 am). You need to book online which I did twice. Both times I received an email shortly after saying the tour was cancelled. Of the four Antalya waterfalls I visited, Lower Duden Waterfall was the best. You’ll need to take a bus for 30-40 minutes, which is easy to catch. Head to the Old Tram line by Hadrian’s Gate and wait for KL08 bus that runs regularly. You won’t be waiting more than 15 minutes. Tip: Download Maps.me for the best offline maps. Get off at Duden Park and head toward the waterfront (while talking to the cats), and you’ll soon see the impressive waterfall. Afterwards, grab some food at the cafe close by, or take a walk around the park area and you could ride the zipline over the river. If you’re on a budget, you can walk down the road to where the supermarkets are. When you’re ready, jump back on KL08 and head back towards the city. 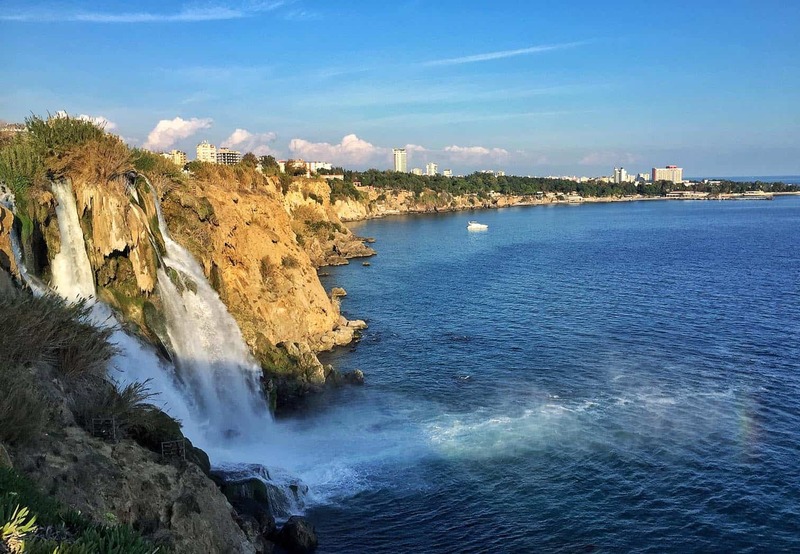 Visit the Lower Duden waterfall – one of the most breathtaking things to do in Antalya. Antalya Museum & Beach Time! You can either walk, jump on the old tram, or take the bus to the intersection of Tarik Akiltopu Caddesi and Yuzuncu Yil Bulvari (you could stay on KL08 from the waterfall). This is close to the Antalya Museum, which is a great way to get clued up on the history of Antalya. If that’s not for you, head down to the nearby Konyaalti Beach. It’s a pebble beach stretching for 3+km giving you ample space to sit. With over 300 days of sun a year you need to spend a little bit of time at the beach in your two days in Antalya. It doesn’t snow in Antalya itself, but the water did start to get a bit too cold for swimming at the end of November (hardly any locals swimming). There are two epic spots for sunset. One at the top of the entrance to Konyaalti Beach where you can see the mountains in the distance. Or watch from the marina where the jetty offers magical sunsets (and sunflower seed sellers) with the mountains in the distance here too. The sunset is legit beautiful in both spots so you can catch one each night you’re here, and there are plenty of stores nearby you can pick up a drink and enjoy (beers at the supermarket ranged from 7 – 12 TL each). Konyaalti Beach is a pebble beach – One of the nicest beaches in Antalya. For transparency, my ‘nighttime’ activities were limited in Antalya as I was training for my first marathon. I went to a couple of bars, but can’t recommend anything in particular. Wander about the Old Town and you’ll find a variety of bars and restaurants. The fountains by the Cumhuriyet tram stop come to life at night too, with colours and music, which was fun. Today you could go and see some ancient ruins and explore some more of the city. Same deal, there’s no specific order you need to do these activities in, but I have put them in the order that is best from my experience. As you have a grasp of the city now, you can choose your breakfast before heading to your attraction. You could even pop by one of the bakeries you’ll find everywhere for a takeaway breakfast. 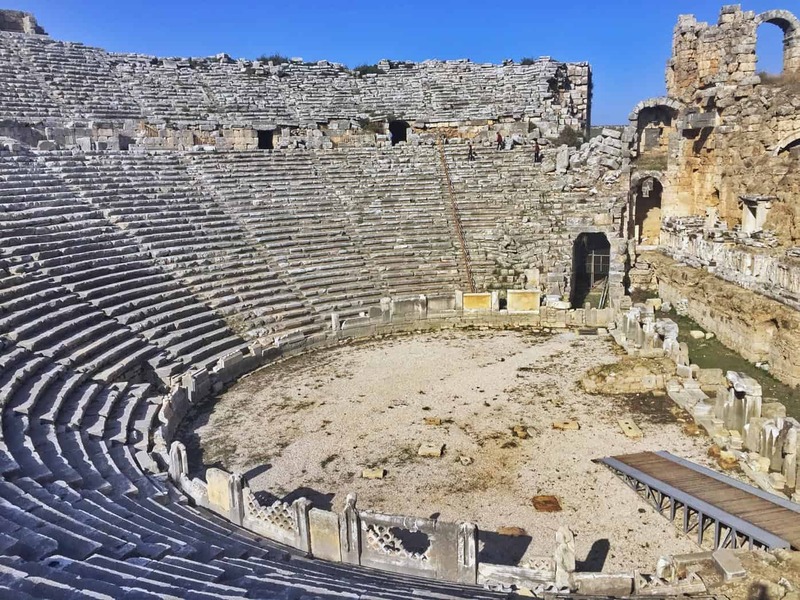 There are two Ancient Cities close to Antalya, Perge, and Termosses. I visited Perge, and after speaking to people who visited Thermoses, if you’ve seen one, you’ve seen both. I chose Perge as it was the easier of the two places to reach. You catch the tram to the stop, Aksu, and it’s a 15-minute walk to Perge from there. On the walk, you get to see the small town of Aksu and before you know it, you’re on the quiet back streets with some nice village views and the scent of oranges from the nearby trees. Perge theatre’s ancient ruins is a nice day activity in Antalya. The entrance fee for the Ancient City of Perge is 25 TL, and I’d suggest 75 – 90 minute here for most people if you’re just wandering aimlessly and taking a few snaps. There wasn’t an audio guide or map which was annoying, but you can stumble your way through with descriptions of what you’re looking at on sign posts. Don’t forget to check out the theatre which might be the most impressive of all the ruins on the other side of the road near the entrance. Head on back to the city for your last few activities in Antalya. AntalyaMark is the main shopping mall downtown, with the Muratpasa tram stop right outside. In fairness, it’s like any other mall (food court on top) anywhere in the world. If that’s not your thing wander down the walking street leading from the shopping center. It’s busy, but you’ll see a variety of cafes, shops and restaurants, with plenty of good people-watching spots. 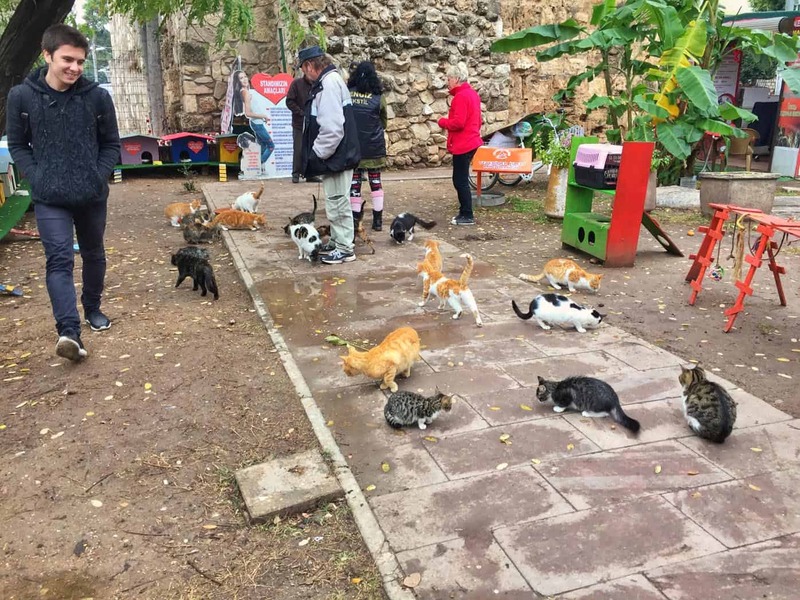 When you reach the clock tower at the end of the walking street, turn right and you’ll find the coolest little cat spot where volunteers run a public cat shelter. Get all the cat pats! The coolest little cat spot where volunteers run a public cat shelter. If you have time, you might want to pop into the Toy Museum or walk along the parks heading west from the marina too. Now that we’re leaving Antalya soon, it’s time to finally visit the markets, or as they’re better known in Turkey, Bazaars. There are a couple of Bazaars next to the south end of the walking street, and there are various small bazaars in the Old Town closer to the marina. Go get lost in the madness! Note: At the time of writing, Booking.com cannot be used to book Turkish properties when searching from within Turkey. HotelsCombined.com links are provided instead which searches all other booking sites for you. As a budget traveller, I usually stay at the cheapest hostels. During my month in Antalya, I stayed in two places, Marina Hostel (32TL), and Uyar Palace (25TL but—it’s anything but a palace). If you’re a budget traveller, I’m going to recommend staying at Marina Hostel as it’s in the Old Town and has nicer facilities than Uyar Palace. However, if you like to cook your own food, you might prefer Uyar as there was a 10 TL fee for kitchen use at Marina Hostel. The one restaurant I frequented as a vegan was Rokka. What I liked about it, was that the staff spoke English, and the menus were in English too. The prices at Rokka were reasonable, and the food was usually decent. If you’re looking for falafel, this is the place for you. Turkish tea is, of course, found everywhere, ranging in price from 1 TL – 4 TL. You’ll see a lot of red carts (they all look the same), selling simmits and other breaded snacks. As much as I try to resist, the simmits were too easy to pick up and walk with for 1.25 TL. There are supermarkets everywhere in Antalya in addition to smaller convenience stores. A few of the popular chains are Migros, Sok (my favourite), Kipa, and A101. Ships are resting in the Marina. Is Antalya In November Worth Visiting? If you’re a part of a couple, yes! I found meeting other solo travellers a bit tricky as the peak season is July and August. 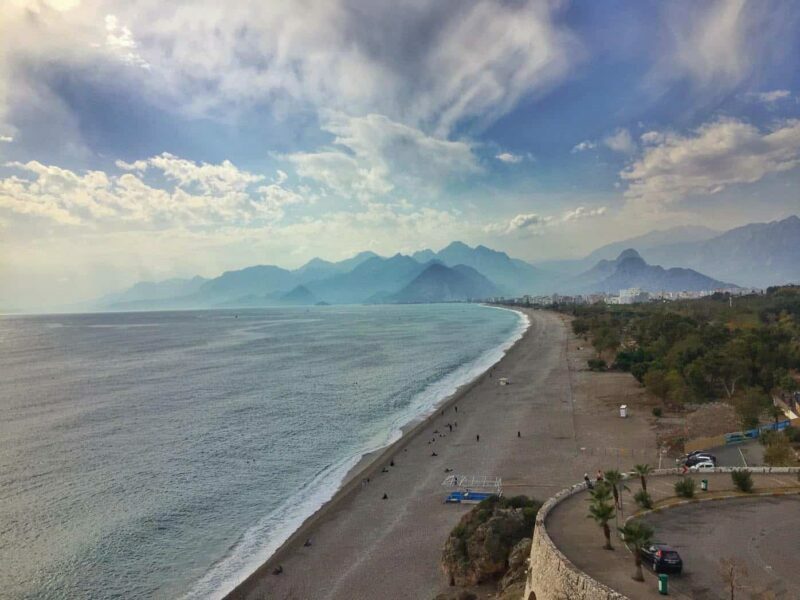 Antalya in November is great as none of the tourist sites are hectic, and the weather is mild (a few chilly days). The big downside is you don’t get those gorgeous hot beach days consistently (Nina’s dream days), but I found myself there often enough enjoying any warmth I could without being surrounded by thousands of fellow beachgoers. If you’re up for slightly chiller beaches but nearly empty tourist sites, visiting Antalya in November is perfect, but if I could return, I’d rather go in October for weather that’s a bit warmer. Where to next? Read this if you’re heading to Cappadocia. What do you think of Antalya’s activities? What are you most looking forward to? Jub has been exploring the world beyond the shores of New Zealand since 2012. He can’t plan to save his life stemmed by his massive FOMO which leads to lots of randomly awesome adventures, but also lots of time on the side of the road attempting to hitchhike because other transport methods are sold out. He blogs over at Tiki Touring Kiwi about his adventures, usually involving sport some way or another. Where to next? Will you be roaming the streets or Budapest or perhaps wander into Croatia or Montenegro? Figure out where to go next using this map!